Today, the Long Island Commemorative Silver Half Dollar Coin remembers when the people of Fire Island refused to become a quarantine island on September 12, 1892. Fire Island, a long, skinny island, lies just below and parallel to Long Island. In 1892, cholera became a problem, especially on ships. The governor of New York wanted to use the island as a quarantine. The residents strongly objected. EVEN WOMEN AND CHILDREN NOT ALLOWED TO LAND. The passengers of the Normannia, imprisoned on the Cepheus did not land at Fire Island today. An injunction obtained from Judge Bernard, of the Supreme Court, in Brooklyn, effectually disposed of that. In the close of the afternoon, the captain of the Cepheus tried to land the Normannia passengers at the central pier of the island, facing the main entrance to the Surf Hotel, and then was witnessed a scene such as for the credit of humanity it is hoped may not soon be seen again. The story yesterday of the fierce opposition made by the citizens of Islip and Bay Shore against the use of Fire Island as a quarantine station has already been told. Early this morning Supervisor William H. Young, of the Islip Board of Health, was busy swearing in bay men and storekeepers as deputy constables. The thirty bay men who Invaded Fire Island late last night had remained on the pier all through the dark hours of the morning, and just after sunrise their number was reinforced by the fifty or more special deputy constables, sworn to preserve the property of the township. The town crowd took up a position at the extreme eastern end of the island just after President Charles G. Wilson and Dr. Edson, of the Health Board, who had remained on the island all through the night, had left it for New York. It was not until the island was clear of these officials, and Dr. Walter Voight, the Quarantine physician, was left in charge, that they made their presence known. Dr. Voight caught sight of them, and going to where they were, ordered them in the name of the State Government to leave the pier. John H. Vail, ex-Supervisor of Islip, replied that the citizens were there awaiting the arrival of the injunction which they expected to receive from Judge Barnard. Dr. Voight repeated his order. Mr. Vail demanded his authority. Dr. Voight had no written order of authorization to show, and amid the derisive cheers of the mob, went back to the hotel to send a message to Health Officer Jenkins and Governor Flower. Then for the next three hours, the one hundred and fifty citizens of Islip and Bay Shore, their numbers having grown, marched up and down the board platforms, occasionally gathering in knots of twenty or so and holding impromptu indignation meetings. All this while Mr. Vail sat in his chair on the stoop of Munsey’s Hotel at the eastern end of the island, awaiting the arrival of the message which was to tell of victory. The little crowd of quarantine officials and reporters anxiously watched the throng at the eastern end of the pier awaiting the signal which should tell whether or not the passengers were to be allowed to land. They saw a little steam launch run up to the pier; they saw a figure jump on to the pier, and then cheer upon cheer rose in the air. The little knot of watchers at the other end then knew that Judge Barnard had granted the injunction. Dr. Voight rushed to the telegraph office and sent a dispatch asking for confirmation of the report. Then there strode into the office of the hotel, Willard P. Reid, counsel to the corporation of Islip; Julius Hauser, town clerk; J. Z. O’Brien, justice of the peace; Dr. W. A. Baker, physician to the Islip Board of Health, and John W. Howell, chief of the deputies. “I have to inform you, sir, that we have this morning obtained an injunction from Judge Barnard, of the Supreme Court, Second District, of Brooklyn. This injunction restrains the State Board from landing passengers from any ship infected or otherwise on this island, which is part of our township. In pursuance of this injunction; I have to warn you that the citizens of Islip, sworn in as special deputies, will remain on the island and resist by force, if need be, any attempt to land on the part of the Normannia’s passengers or the passengers of any other infected vessel. “Where is the injunction?” asked Dr. Voight. “We have not yet received it, but it is certain, to be in our hands in the course of the afternoon,” replied Mr. Reid. Dr. Voight had previously received confirmation of the news in a dispatch from New York and did not continue the useless argument then, it was then about 1:30 o’clock in the afternoon. For two hours the crowd of belligerents strolled about the piers with the air of those who already owned the island, while Dr. Voight and the reporters, appointed for the time being as special deputy State officers, awaited the arrival of the Cepheus. There was a simultaneous rush of the hotel people, the quarantine officials and the enemy at the eastern end of the island, as the Cepheus, which had passed the bay at last, hove in sight. The crowd of Islip citizens, shouting and yelling; like a pack of hungry wolves, lined the central pier, with Mr. Reid, ,Supervisor Young, Mr. Howell and Coroner Moore at their head. As the Cepheus slowly steamed round the island from the rear and came nearer and nearer the dock, the mob or the pier grew perfectly insane with rage and excitement. The two big decks of the iron steamboat were packed with a crowd of white-faced, haggard men and women and children, all huddled together, as if for warmth and mutual comfort. Long days of detention, first on the plague-stricken ship with cholera ever hovering, around them ready to strike; then on the Stonington, and last the sleepless night on the Cepheus, had seemingly beaten all life and hope and spirit out of them. It was the ghost of a defiant cheer that they raised in response to the howls of the worthy Islip citizens, who stood waiting to receive them. Then the blue uniforms of six New York policemen became visible as they pushed their way to the front and seized the deck rope preparatory to making the boat fast to the pier. Mr. Young stood in the front of the crowd. “You don’t land here,” he shouted, and as the boat lines were thrown on the pier, the Islip men at a signal from him threw them off into the water. “Then land them in New York,” yelled the Islip men. “We won’t have them here.” Once more the lines were thrown onto the pier by the policeman and once more thrown off. It seemed now as if the captain of the Cepheus would give up the struggle to land his unfortunate passengers, and the Islip mob set up another yell as the big boat drifted out a little into the stream. But at a signal from Dr. Voight, who had pushed his way to the front, she stopped. Dr. Voight then stepped into the boat. It had gone scarcely a dozen yards when the boat stopped and turned and the men began rowing back as if for their lives. “Why don’t you go to the Cepheus,” asked Mr. Reid. “They refuse to take me,” said Dr. Voight as he stepped onto the pier. “Yes we do,” answered the men amid loud cheers. Then there was a louder shout as the Cepheus once more hove slowly up to the pier. Now the features of some of the better known passengers could be clearly distinguished by the newspaper men. In the front of the upper deck; stood B. T. Wall, who had been appointed by the State Hoard of Health to take possession of the island to land the passengers. A dozen feet to the left of him was A. M. Palmer, while behind Mr. Palmer were E. L. Godkin and Senator McPherson, of New Jersey. On the after deck, almost at the stern, stood Miss Lottie Collins tastefully dressed in dark blue serge and fiercely shaking her little hands at the belligerents below. A blood-curdling howl was the only response. All this time the six creatures wearing the uniform of New York policemen stool by like a lot of frightened sheep, not caring, apparently, to move a hand. If they had but the courage to draw their clubs or revolvers and jump on to the pier, as they might easily have done at any moment, the passengers could easily have been landed. There was any amount of noise, but no fight in the crowd before them. Yet the officers moved not. “Oh, for two minutes of Inspector Williams,” murmured one of the newspaper men, and his sigh was echoed by all those in sympathy with the unhappy passengers. “You are behaving like fools and brutes,” shouted Mr. Wall, as the Cepheus moved away again. Then Miss Lottie Collins came to the fore. Pushing her way to the front of the crowd on the upper deck, she stood for a minute looking down, on the shouters, her lips curled in scorn, her cheeks flushed with anger, her fair hair fluttering in the wind. The Cepheus now moved slowly to the western end of the dock and then stopped. A boat was lowered and Mr. Wall got into it and was rowed right up to the pier’s side. “You don’t land here,” cried the crowd. Mr. Wall, however, read the Governor’s proclamation, amid a chorus of howls and groans. 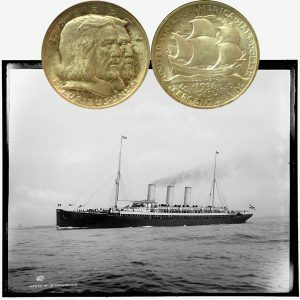 The Long Island Commemorative Silver Half Dollar Coin shows with an image of the Normannia, circa 1890.